As the travel-weary Formula One circus rolls into the madding maelstrom of downtown Shanghai, there are still a few drivers who don't know what they'll be doing next year. Some are hopeful, some less so. Two such men are Takuma Sato and Anthony Davidson, chaps for whom the well-worn cliche 'friends and rivals' could almost have been invented, so apt is it. They first crossed swords, albeit as (team)mates, when in 2001 they washed up together at Trevor Carlin's well-run British Formula Three outfit. Optimistic, confident, talented, intelligent and ambitious, they were jetsam all the same. They had been thrown together, by circumstance. The one (Taku) had been racing for only four years; the other (Ant) had been karting since he was in diapers. Together, they won almost everything that year. In the end, it was the elder of the two, Taku, drawing on his greater F3 experience, who became Champion; but Ant was also very impressive, especially in the second half of the season. Now, and for a few years now, they're teammates again - and F1 teammates at that. Twelve months ago, Davidson's name was on not only British journalists' lips (that hasn't changed) but on others', too (that has, because F1 is fickle that way). He had parlayed his B.A.R-Honda 'Man Friday' status to perfection throughout 2004, trading fastest laps with Michael Schumacher every other weekend, and was regarded by many as 'the boy most likely to'. But, for whatever reason(s), it has never (yet) happened for him. Sato, by contrast, although he has always been quick (especially in fast corners, where he can sometimes be staggeringly rapid), has tended to attract only the wrong kind of attention. Bluntly, his problem is simple: he shunts too much. Sometimes there's an excuse, occasionally even a genuinely good reason. But, like other fast but furious racers who drive on their reactions (and emotions) - Juan Pablo Montoya is another example - Taku remains, despite having now driven as many Grands Prix as Juan Manuel Fangio, an accident waiting to happen. He rarely has to wait very long. By contrast, Ant has only ever started three Grands Prix, two of them for lowly Minardi in 2002, and has yet to finish one. I felt for him earlier this year, when he finally got his big chance. On the Friday evening of the Malaysian Grand Prix weekend, Taku was taken ill - debilitatingly ill.
Ant got the call from B.A.R-Honda's team manager Ron Meadows - "Get out of bed, Ant, mate! You're racing!" - and, handicapped by having to practise on a set of tyres that his already-feverish teammate had flat-spotted the day before, he struggled to find a rhythm at the one track which mechanical failures had prevented him from learning thoroughly on the Friday 12 months before. As a result, he qualified, well, poorly. And then, in the race, his car gave up the ghost on lap 2. I spoke to him at length two weeks later, in Bahrain. Yes, he was gutted; but he knew why things had gone wrong, and he knew it hadn't been his fault. He might have the stature and bearing of a stable lad, I remember thinking at the time, but undoubtedly he also has the right kind of arrogance. Not a trace of haughtiness or superciliousness, mind; just hefty dollops of conviction and poise. 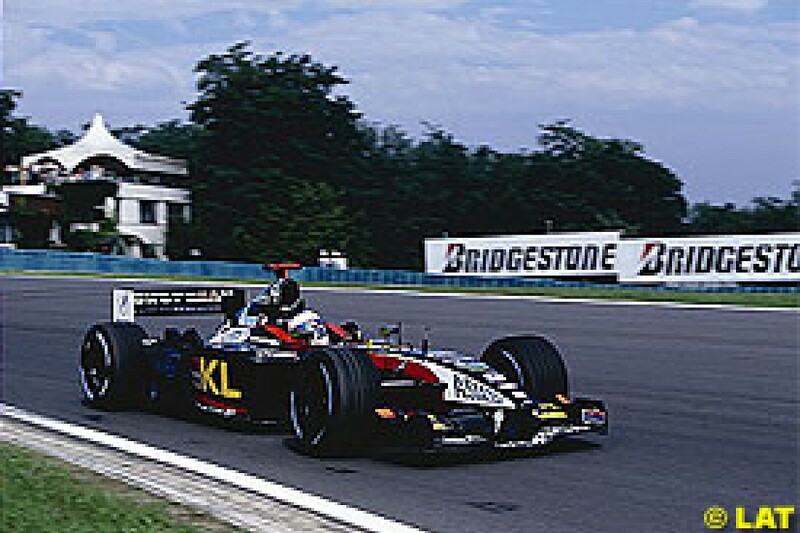 Nonetheless, Davidson's critics 'diss' his two Minardi races. In my view, they're wrong to do so. His first was in Hungary, and it was also his first ever Grand Prix. On an ultra-dusty circuit he didn't know, in a shitbox he also knew not, he qualified a respectable half-a-second behind his teammate, Mark Webber. At Spa, scene of his second and final Minardi outing, he ended up half-a-second slower in qualifying than Mark, too. But 2002 was the last season of the 60-minute 12-lap quali-format, remember, and Ant was ahead of Mark throughout most of that hour. Indeed, it was only in the final minutes of the session that the Australian dug really deep and nailed a banzai, zero-margin, white-knuckle lap - a time he was able to approach only that once, incidentally. Yes, yes, yes, I know: Ant spun off in both races. Wanker, right? Well, no. The 2002 Minardi had a truly hopeless power steering system, and in the end the half-pint 23-year-old F1 virgin simply ran out of strength. Embarrassing, perhaps, but hardly surprising. The same thing happened at Spa, for exactly the same (equally unsurprising) reasons - but not before he had got ahead of Webber, cut a quicker fastest lap than Webber, and pulled away from Webber and begun to close on Olivier Panis's far-quicker B.A.R-Honda. And all that on an older (read slower) set of tyres than Webber, too. Moreover, Davidson is now much fitter, far stronger and infinitely tougher than he was then, having trained specifically over the past three years to optimise the effectiveness of his lissom five-foot-five-inch frame. In truth, the British side of B.A.R-Honda has for more than a year been itching to ditch Sato and replace him with Davidson - a move that, for reasons of national pride and, it has to be said, propriety, Honda has always blocked. And so it was that the super-quick boy who used to bang wheels with Jenson Button at Rye House and Buckmore Park and countless other British kart tracks every other weekend in the early 1990s, and win just as often as not, was left on the sidelines, fortnight in fortnight out, as Honda's favourite son clattered his way around the world's Grand Prix tracks, leaving shards of carbonfibre (not always his own) in his wake. And now, astonishingly, Ant and Taku remain rivals - rivals, that is, for F1 drives which may or may not be available (or may or may not even exist). If Honda launch a B-team, or some such entity, for 2006, then they'll both be in the running to race for it. Equally, their managers are talking to Jordan (soon to be Midland) boss Colin Kolles on a regular basis. Ant's people might just be able to convince the phlegmatic Rumanian ex-dentist (yes, that's our Col!) that Gallahers, who own the Benson & Hedges and Sobranie tobacco brands, might increase the level of their sponsorship if only a British driver might be included in Midland's 2006 set-up. And Taku's reps are trying equally hard to persuade our Col that fielding a Japanese will secure Toyota engines for years to come. And then there's Williams. Because, although, personally, I expect Sir Frank to run Mark Webber and Nico Rosberg next year, there's a possibility that he might prefer to give Keke's boy a year in the 'Man Friday' role, the better to learn circuits and whatnot so as to step up to the plate with confidence in 2007. Indeed, I think that would be the wisest course - after all, Nico is still only 20. If that's what happens, then Ant and Taku will be in the frame for a Williams race drive for 2006 - and their managers know it. For Andrew Gilbert-Scott and Matthew Winter, in Sato's corner, the arguments are similar to those they're using on Kolles: "You want free Toyota engines in 2007, don't you, Frank? Well, sign our boy and you'll get 'em. Mark our words!" For Dave Robertson and Didier Stoessel, the shrewdies who advise Davidson, the argument is less clear-cut - but, ultimately, more up Sir Frank's street: "Our boy's bloody quick. He's as quick as Jenson. He's proved it many times. Here, let me show you this vid from Lydd. The quality isn't brilliant, but..."
Moreover, and this should surely cut ice with Sir Frank - a Knight of the Realm who flies the Cross of St George on a flagpole outside his factory and atop his Oxfordshire mansion (and, of course, once had it painted onto the tail-fin of his much-missed Falcon 900) - Davidson is not only British but English, too, dammit. From Hemel Hempstead, to be precise, a quintessentially English town in the south Midlands, easy commuting distance from Williams's factory at Grove. Now, he lives nearer still, at Brackley. Verily, he was born to drive for Sir Frank. 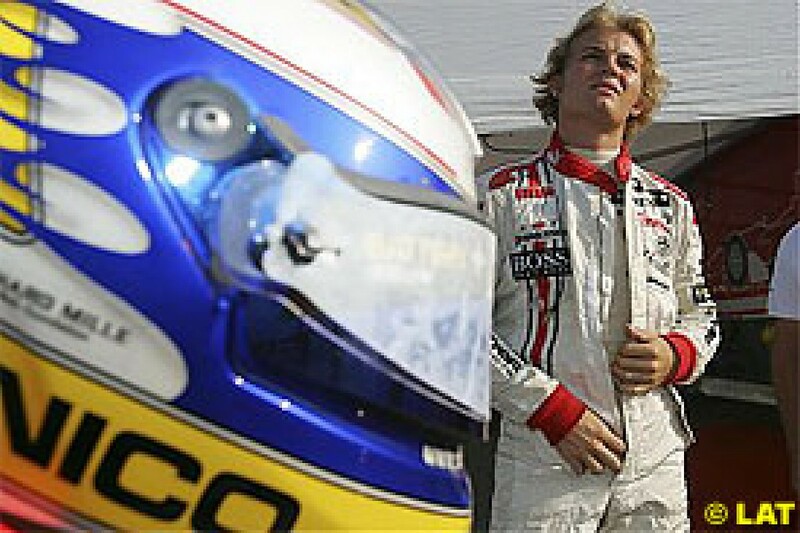 So was Rosberg, of course, if for different reasons (his dad won the Championship for Sir Frank 23 years ago). The thing is, though, they can both drive for Williams - in time. Webber has had a hard 2005, no doubt about that. But his recent performances - such as at Suzuka, where he was top-notch - have shown that, although his relationship with Williams's senior management has undoubtedly turned a bit sour, perhaps irredeemably so, he's still a canny, dogged and above all rapid racing driver. But, if his marriage with Williams is already on the rocks, then he has 2006 to find a new home for 2007. But there's no reason why, with a clutch of decent early-season performances in a reliable Williams-Cosworth under his belt, he shouldn't do just that - just as Jarno Trulli, for example, used 2004, during which year his marriage with Renault clearly became unsalvageable, to feather his nest at Toyota. So, to sum up: next year, alongside Mark, Sir Frank should run Ant - and sign him to a no-frills, one-year, make-or-break contract, attached to which a stipend of US$750,000 would probably suffice (if not, then the boy simply ain't hungry enough). And if Davidson makes the grade, then Williams will have found a home-grown star of the future who might stay for years, a la Damon Hill. And if he should fail to cut the mustard, well, then it will be a case of sorry-chum-you've-blown-it - and a ready-made replacement will be waiting in the wings in the shape of Rosberg, with a queue of others ready to take Webber's place should he also move on, which, as I say, I expect him to do. But I don't think Ant would fail to cut the mustard. No, I think Davidson-Rosberg would be very cool, very fitting and very Williams.